Preheat the oven to 435°F (223°C). Grease a baking sheet very lightly. Mix the bread crumbs with the parsley, lime zest and half the lime juice. Season the mixture well. Place the fish on the baking sheet and drizzle over the remaining lime juice. Cook the fish in the oven for 10 minutes. 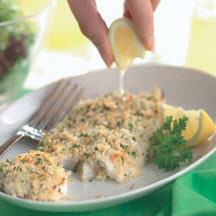 Remove from the oven and carefully press the bread crumb mixture down lightly over the fish. Return to the oven and bake for a further 15 to 25 minutes or until the bread crumbs are crisp and golden and the fish is completely cooked.